The comfort of your home depends on more than temperature settings. The air quality inside your home also greatly affects your health. Tiny particles like mould, bacteria and moisture can cause serious respiratory problems, while pet dander, pollen and dust can be irritating - even to people without sensitivity or allergies. Advanced products such as air purifiers and cleaners, working together with heating and cooling systems, help reduce concentrations of allergens and other contaminants in the air. In addition, there are other IAQ products that can improve air circulation and humidity levels in your home. Air filters help practice the principle of dilution which means that they trap and reduce the concentration of common pollutants in your home. Filters that have been properly tested for effectiveness are rated using a Minimum Efficiency Reporting Value (or MERV), that describes the size of the holes that allow air to pass through the filter. The higher the MERV rating (rated from 1 to 16), the smaller the holes, the better the filtration. Healthy Climate products, the brand that is used by Balcaen and Sons, has 1” MERV8 filters in various sizes; 3” and 5” MERV11 filters; and 5” MERV16 Carbon Clean filters that remove over 95% of particles ranging down in size to 0.3 microns (1/25,000 of an inch) and over 90% of bioaerosols and microorganisms down to 0.01 microns. Proper humidity levels not only create healthier air, they can also make air feel better even at more energy-efficient temperatures. 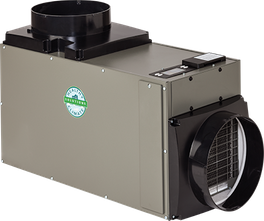 Humidifiers can be attached to the duct work system and usually prove to be effective and provide adequate whole-home humidity. 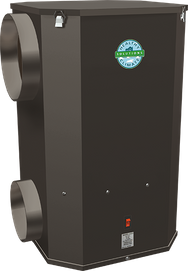 Healthy Climate offers both 12 gallon and 17 gallon capacity in their basic bypass-style humidifiers. A fan assisted model or power humidifier with 18 gallon per day capacity is also available. If the problem is too much humidity, Healthy Climate has a family of whole-home dehumidifiers available. These devices can reduce humidity to as low as 40% and can work independently or as part of the home’s heating system.